I have a friend that works at one of our local grocery stores. Last year he was telling about a salad that this store sells. I have had this salad in the back of mind for the past year and finally have gotten around to making it. I did change it a little from how the store makes their salad, to match my taste and to what ingredients I had at my home. 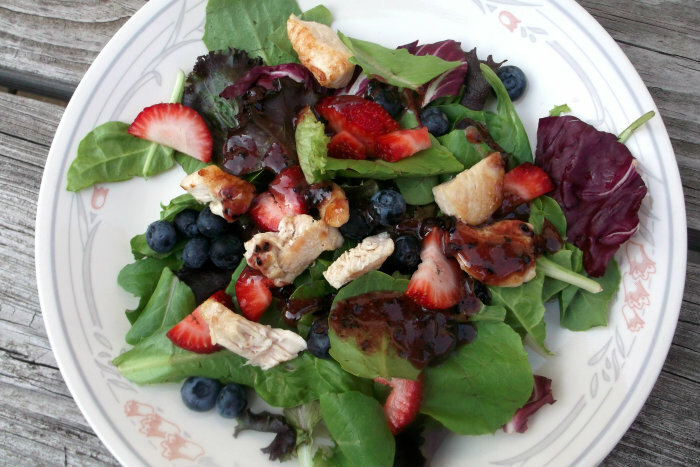 The salad features spring lettuce mixture, strawberries, blueberries, and chicken served with homemade blueberry vinaigrette. The stores salad uses Romaine lettuce, almonds, and raspberry vinaigrette along with the other ingredients that I mentioned. Either way this salad is scrumptious and healthy. It has been only the last couple of years that I have been serving lettuce salads with fruit; the first time I was served this combination I was a little hesitant to try it, but I found that fruits pair very nicely with this type of salad. 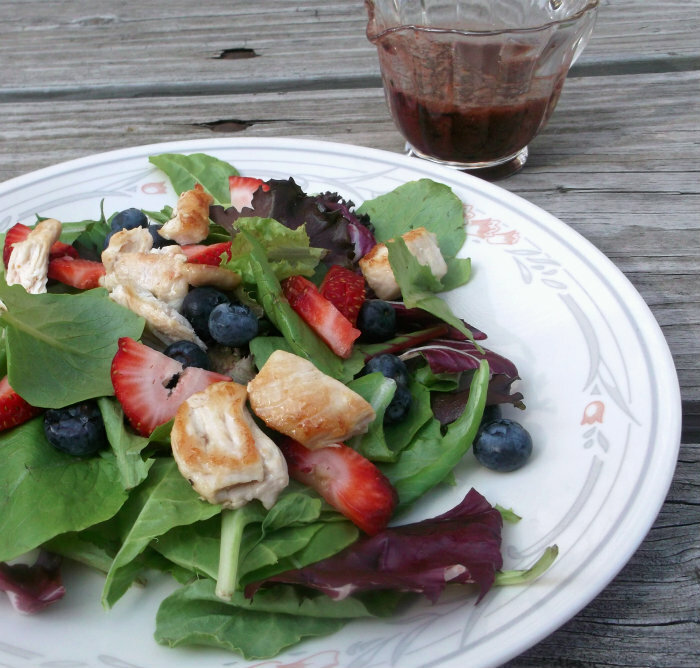 The blueberry vinaigrette that finishes off this salad is a simple one to make with only a few ingredients and it takes only a few minutes to make. Wash and dry the lettuce, strawberries, and blueberries before tossing them together. 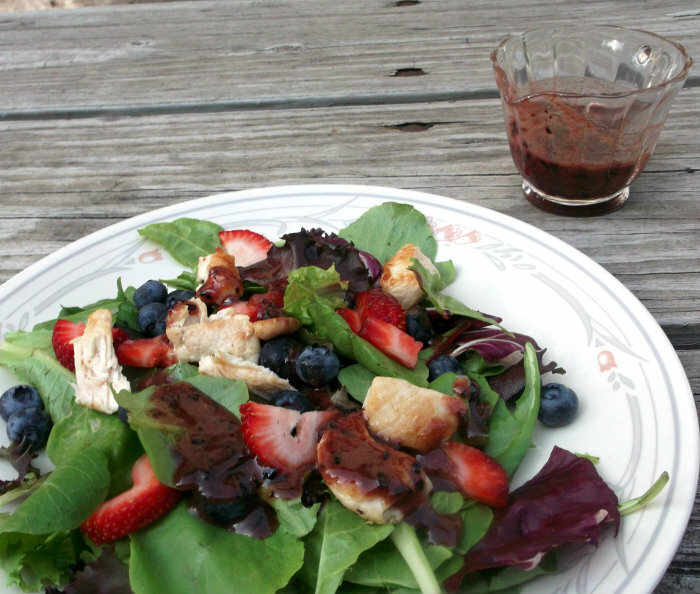 Place all the ingredients on a plate and drizzle with blueberry vinaigrette (recipe to follow). Combine ingredients in a blender of food processor and blend until smooth. Serve immediately. This was enough vinaigrette for about 3 salads. Hi Dawn, This Salad looks so delicious, I admired it the ather day but forgot to leave a note! I’m going to prepare it today for a light supper – I look forward of tasting the vinegrette and th eberries with the chicken! I’ve only been adding fruit to lettuce salads for a couple of years, too. The combo works so well, I’m surprised it took me so long! This looks terrific – thanks so much. It looks healthy and delicious! What a healthy and gorgeous salad. This would be perfect for the hot summer days!